The global fiber based packaging is witnessing steadfast growth over the past few decades owing to the numerous applications of fiber based packaging across several end-use industries. The fiber based packaging market is primarily driven by the growth of the packaging industry and shift in consumer preference for eco-friendly packaging solutions. Further, easy availability of raw material for the manufacture of fiber based packaging products and government statutes in favor of naturally sourced packaging solutions is fuelling the growth of fiber based packaging market. A report by Transparency Market Research (TMR) projects the global fiber based packaging market to expand at a CAGR of 3.8% in terms of revenue between 2017 and 2025. At the pace, the market’s valuation of US$284 bn in 2016 will become US$383.5 bn by the end of 2025. The report segments the global fiber based packaging market by packaging type into corrugated boxes, cartons, partition & inserts, bottles & cup carriers, trays, plates, clamshells, display packaging, and bags and sacks. Of these, corrugated boxes segment dominate the market with an estimated share of more than 45% in the overall market by value. This is because corrugated boxes are ideally suited for primary and secondary packaging needs and are mainly used in transit packaging across several industry sectors. Cartons hold significant share in the market as they are widely preferred for primary packaging in food and beverages, cosmetics and personal care, pharmaceuticals, etc. On the basis of material, the global fiber based packaging market has been segmented into corrugated, boxboard/carton board, molded pulp, kraft paper. Of them, corrugated segment accounts for more than 50% market share by value. By end-use industry, the fiber based packaging market has been segmented into food packaging, beverages packaging, tobacco packaging, healthcare packaging, personal care & cosmetics, homecare & toiletries, electrical & electronics, e-commerce packaging, chemical & fertilizer, and other industrial packaging. Amongst them, the segment of food packaging holds dominance with close to 40% share in the overall market by value. The global fiber based packaging market has been segmented into virgin and recycled by material source. Recycled fiber segment is likely to dominate accounting for almost three-fourth revenue contribution to the market. The segment is likely to expand at a CAGR of 3.9% in terms of value over the forecast period. In terms of levels of packaging, the fiber based packaging market can be segmented into primary packaging and secondary packaging. Of the two, secondary packaging dominates accounting for more than 50% revenue contribution to the market. The global fiber based packaging market has been segmented into five regions, namely North America, Asia Pacific, Latin America, Europe, and the Middle East and Africa. Asia Pacific is expected to register the leading revenue contribution of US$182,318.8 mn by the end of the forecast period. Europe is a significant market that currently holds 22.6% of the global fiber based packaging market vis-à-vis revenue. However, the Middle East and Africa is projected to register the leading CAGR of 5.8% over the forecast period. The region is expected to display rapid growth among other key regional markets over the forecast period. Key players in the global fiber based packaging market include International Paper Company, DS Smith plc, Huhtamaki Oyj, Smurfit Kappa Group plc., Sonoco Products Company, WestRock Company, Georgia-Pacific LLC, Pratt Industies Inc., Reynolds Group Holdings Ltd., U.S. Corrugated Inc., UFP Technologies Inc., ESCO Technologies Inc. Ltd., Brodrene Hartmann A/S, KapStone Paper and Packaging, Mayr-Melnhof Karton AG, Rengo Co. Ltd., Mondi Group, Stora Enso, AR Packaging Group AB, and BillerudKorsnas AB. The report begins with an overview of the global fiber based packaging market, evaluating market performance in terms of revenue, followed by TMR’s analysis of key trends, drivers and restraints witnessed in the global fiber based packaging market. Impact analysis of key growth drivers and restraints based on the weighted average model is also included in the report. To compute the market size, in-depth secondary research is done. Data points such as regional splits and market split Packaging Type, Material Type, Material Source, Level of Packaging and, End User Base, have been assimilated to arrive at the market estimates. The report comprises the forecast of the global revenue generated by sales of fiber based packaging market. TMR triangulates the data via different analysis based on supply side, demand side, as well as dynamics of fiber based packaging market. In order to understand and assess opportunities in this market, the report is categorically divided into six key sections on the basis of Packaging Type, Material Type, Material Source, Level of Packaging and, End User Base, and region. The report analyses the global fiber based packaging market in terms of value (US$ Mn) and volume (Mn Units). Vital feature of this report is the analysis of the global fiber based packaging market by packaging type, material type, material source, level of packaging and, end user base, and region; and the corresponding revenue forecast in terms of absolute dollar opportunity. This is traditionally overlooked while forecasting the market. However, absolute dollar opportunity is critical in assessing the level of opportunity that a provider can look to achieve as well as to provide potential resources from sales perspective of the global fiber based packaging market. To understand key segments in terms of their growth and performance in the fiber based packaging market, Transparency Market Research has developed a market attractive index. The resulting index should help providers identify existing market opportunities in the global fiber based packaging market. 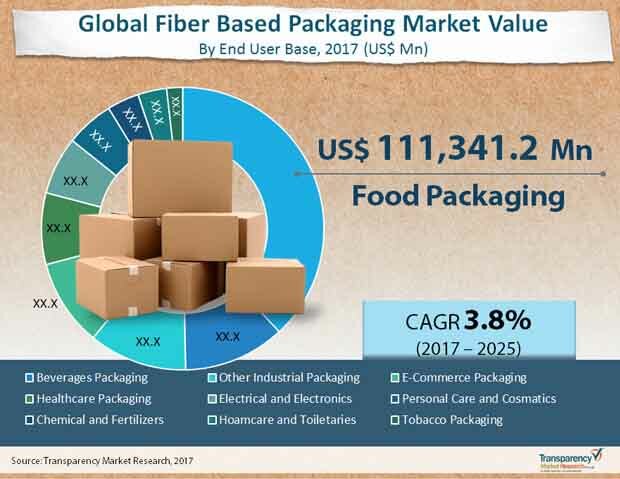 In the final section of the report, Fiber based packaging market competitive landscape has been included to provide a dashboard view of companies that manufacture and provide fiber based packaging services. The report contains company profiles of some of the players in the fiber based packaging market. The market players that have been profiled include - International Paper Company, DS Smith Plc, Huhtamaki Oyj, Smurfit Kappa Group PLC, Sonoco Products Company, WestRock Company, Georgia-Pacific LLC, Pratt Industries Inc., Reynolds Group Holdings Ltd., U.S. Corrugated, Inc., UFP Technologies, Inc., ESCO Technologies Inc., Ltd., Brodrene Hartmann A/S, KapStone Paper and Packaging, Mayr-Melnhof Karton AG, Rengo Co., Ltd., Mondi Group, Stora Enso, AR Packaging Group AB, BillerudKorsnas AB.